WARNING! This recipe may seriously damage your diet! Preheat oven to 180C. Grease and line the base of a 20cm springform cake tin. Whisk the eggs and caster sugar in a mixing bowl for 10 minutes until the mixture is light and foamy and leaves a trail when lifted. Sift the flour into the mixture and fold in with a metal spoon. Pour into the prepared cake tin and bake for 25 mins when it should be springy to the touch. Cool slightly and then turn out onto a wire rack and when cold, return it to the tin. To make the truffle topping, place cream in the pan and bring to the boil, stirring continuously. Remove from the heat and add the white chocolate and stir until melted and combined. 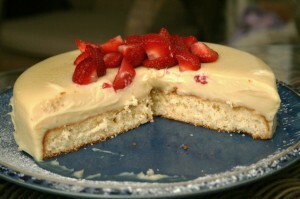 Stir in the mascarpone cheese, pour the mixture onto the cake and chill for 2 hours. Remove from cake tin and transfer to a plate. Decorate the top with the strawberries. Also works well with raspberries or chocolate curls to decorate…..or both??? This is lush and decadent and is wonderful for guests as it always seems impressive. When I made this for the first time, my husband declared it was the best dessert he had ever eaten……..and he’s tried a few! He liked it so much, it got him in the kitchen making it.